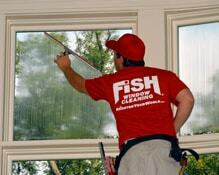 Welcome to Fish Window Cleaning of Houston, TX! We have 6 convenient locations within the Houston area ready to serve you! Please see the map below for our local phone numbers. We clean all types of windows for low-rise commercial and residential customers. We are committed to your satisfaction! We clean all types of interior and exterior windows for homes in Houston. We also clean chandeliers, gutters, ceiling fans, outdoor light fixtures, and much more! We respect your home by wearing shoe covers and using cloth pads underneath your windows as we clean to protect your carpet and wood floors. We even use environmentally-friendly cleaning products so you, your family, and even your pets, won't have to endure harsh fumes. Our cleaners are honest and trustworthy, so you can feel safe and secure while we are making all of the glass in your home sparkle! We help your businesses always look its best by maintaining your storefront or commercial building. We want to give your customers yet another reason to keep coming back. We can make your windows, doors, elevator glass, mirrors, and chandeliers gleam. Our cleaners are licensed, bonded, and insured, so you don't have to worry when you hire us! We offer reliable year-round scheduling, emergency cleanings, and various billings options. Let us show you how Fish Window Cleaning can Brighten Your World today!